The son of a US marine, Grandmaster Woo was born in Guangzhou, China, and spent his formative years there. He took great interest in martial arts at a young age, and it wasn’t long before hard training with renowned masters earned him a reputation as a highly skilled fighter. In 1960, Grandmaster Woo moved to Boston, Massachusetts. In 1967, he received is Grandmaster certification and opened the Bamboo Hut Club, the first authentic kung fu school in Greater Boston. His legendary lion dance and demonstration team gave unforgettable performances for traditional Asian festivals, community gatherings, and other various functions. In the 1970s, he became one of the founders of the New England Kung Fu Federation, and hosted the first Beijing Wushu team in New England. Again, in 1992, he hosted the Shaolin monks in Boston during their world tour. 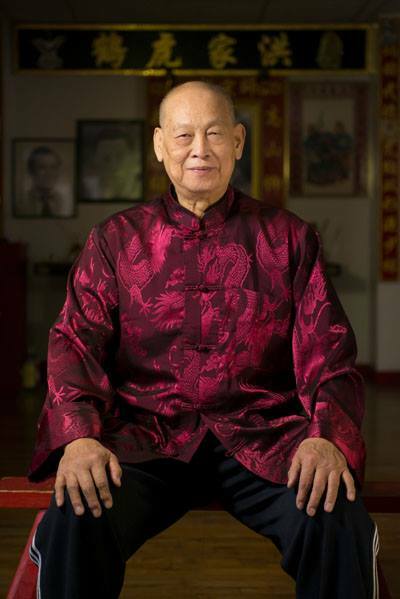 Having practiced martial arts for over 70 years, Grandmaster Woo exemplifies that a true master never stops learning and improving. He constantly seeks to make changes and incorporate the essence from other styles to enrich his Hung Gar teachings. By introducing physics and philosophy into his lessons and encouraging independent thinking from his students, he has developed a unique teaching style that attracts kung fu learners from all over the globe. He is dedicated to teaching authentic Chinese martial arts out of passion, mastering the Taoist breathing technique and the Hung Gar bridge hands to create his own five elements Tai Chi style. Regardless of previous training, this approach will help all students improve their health, as well as develop and cultivate a high level of chi. Students seeking deeper theory of self defense techniques will be guided to explore the complex applications that are hidden within every movement. Five Elements Tai Chi was created by Grandmaster Winchell Ping Chiu Woo in the 1980's when he was teaching in Springfield, Massachusetts. It was a joint venture between Grandmaster Woo's Springfield Martial Art Research Center and the Tiger Crane Tai Chi Association at Harvard University. Its name is based on an ancient Chinese philosophical understanding of the Universe's nature being made up of the basic Five Elements: metal, wood, water, fire, and earth. Each element has a unique power special to its nature, exhibiting a unique relationship with the other elements. One of them may either mutually reinforce or neutralize another. In order to correct the excesses and deficiencies of the martial art techniques based on the Five Elements, Grandmaster Woo’s Tai Chi combines Tai Chi Yin Yang theories with the Five Elements philosophy. Additionally, he has adapted Hung Gar Kung Fu's fighting techniques for the form. In short, Five Element martial philosophy, Yin/Yang theory, and Hung Gar skills are the heart and foundation of this style. The theories, techniques, and basic structure of Five Elements Tai Chi originate from the martial arts of the Lingnan area in southern China. These styles have an ancient history coming from the Southern Shaolin Buddhist Temple. The most significant styles led to the forming of the "Hung, Liu, Choi, Li, and Mo" kung fu systems, which are named after the five famous masters of southern Chinese martial arts. The essence of Tai Chi practice is the development and use of the body's internal energy, Chi. How Chi transforms, moves through the body, and works as a living force is explained and symbolized by the Five Elements philosophy merged with the Yin and Yang theory. The mutual reinforcement and restraint among the Five Elements techniques create an extreme power when utilized correctly. The methods Grandmaster Woo created can consistently express and convert a person's internal power to external power of both linear and circular force. It teaches how to use Hung Gar's external bridge hand techniques and the classical movements of the five animals and five elements as fighting tools of internal power. Strikes, kicks, throws, joint locks, etc. are all integrated into the soft and flowing movements of the form. While the martial applications of the form may not be obvious, they form the core of the style. The philosophy of Five Elements Tai Chi is to naturally promote the health of the body. Tai Chi does this through practicing the movements, performing martial art techniques, and using authentic Taoist Qigong breathing methods. Mastering proper breathing is essential to directing the Chi to travel around the human body's 12 chi meridians and the 108 major points. Through the exercises, one can achieve a balance of yin and yang and maintain good health. Frequent practice of the Five Element Tai Chi form will promote healthy heart function, improve the respiratory system, enhance blood circulation, and reinforce the body's metabolism. Five Elements Tai Chi is a unique system with its forms and actions different in many ways from other styles of Tai Chi. The end result of practicing Five Element Tai Chi is better health, the cultivation of internal power, and a superior knowledge of effective self-defense. Copyright © www.hunggarkungfuliondanceacademy.com/www.hunggarQuincy.com 2017. all rights reserved.